Free 5€ TipBet Without Deposit! How To Claim the 5€ Free Bet Bonus? TipBet, one of the best up-and-coming bookies out there, has just announced a special promotion. It revolves around a 5€ free bet that you can use fo bet on eSports matches. Considering other bookies also offer similar bonuses, TipBet has a solid trick up its sleeves. While other competitors are having esports bonuses that require you to deposit money first, TipBet requires no such thing. The process of obtaining the 5€ TipBet free bet for betting on esports on their main website is rather simple. Here's the walkthrough so you know what you are dealing with! How to get the free 5€ TipBet bet? As we already explained above, you will not need to deposit any money in order to get this bet. More importantly, you will not even need to fill out your credit card info. And I know for a fact that this is a red alert for many users, especially when it comes to various betting bonuses. Head on over to the TipBet Official Website. Once there, you will have to register a free account. To get this Freebet simply click on the big red button on the top right corner saying REGISTER NOW FOR FREE! Then, all you will need to do is fill out all the necessary information (first name, last name, address, username, and password). You will have to confirm your email after which you will be redirected to their official website once again. Now, login to your account by using the username and password combination you entered when registering. Once you do this, the rest is pretty straight forward. This is what you will see on the top right corner once you are logged in. 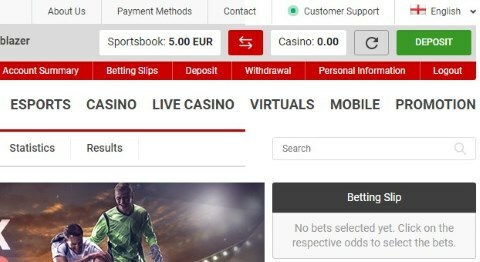 In order to claim the free bet, navigate to the Account Summary page. The button is located right underneath your username on the top right corner of the main page. Now you will have to click on the Offers button and you will be redirected to the area where you need to enter the voucher code. Consider yourself lucky as we will provide you with it! As you can see, all you have to do in this step is enter the voucher code ESPORTS and click on Submit. After doing that, you will be informed that you have claimed the bonus. Viola, simply refresh the page and go to your account summary. There, you will see your new balance of 5€ that you can use to bet on various eSports matches. With the Dreamhack Austin going on and lots of good matches to choose from, TipBet could not choose a better time for this bonus… And for that, we sincerely thank them! Check out the full review of TipBet here! About the Author: Article written by Hipster Jesus, eSports enthusiast and an active member of the CS: GO community. In his free time, he likes to rush B on competitive servers and scream “CYKA BLYAT” at trolls. Contact “Hipster Jesus” on Twitter.